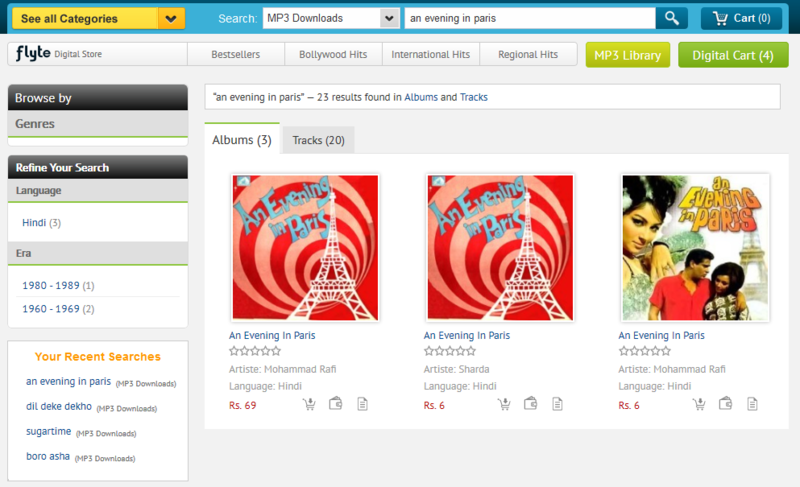 It took its time, but we finally have a mainstream Indian MP3 digital store, thanks to flipkart. We did have the saregama store, but it was nowhere near as convenient as what the likes of iTunes & Amazon have offered outside India since times immemorial. I’ve already bought a bunch of tracks from the store, and I’m just getting started. Track naming: Not exactly named very nicely, but at least the ID3 tags are in place, so they work well with the usual music players. 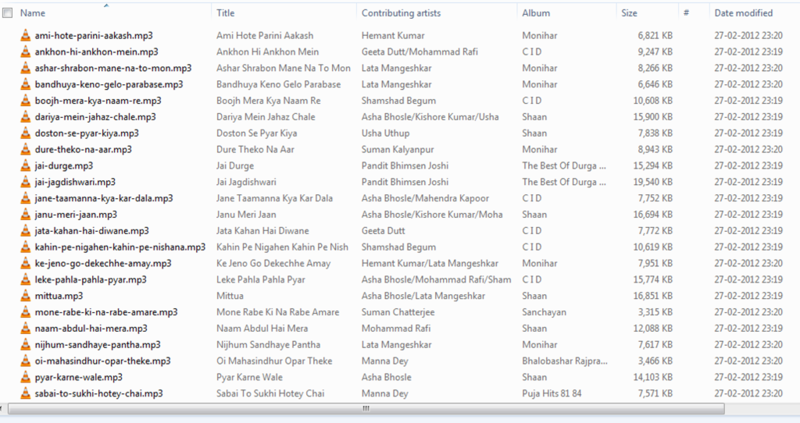 Album fragmentation: At least for Hindi & Bengali albums. This can lead to a bit of confusion, and also means that you might need to download tracks from multiple albums though they should be clubbed into one. New Digital Wishlist: While there’s a separate link to your “Digital cart”, the wishlist link is still the same. However, it’s been split into a Digital & Non Digital section. Downloading files: The MP3 Library gives a convenient list of purchased tracks (wonder when they’ll start a cloud player service). Best of all, there’s a “Not Downloaded” section that makes life easier. You need to download each track separately unless you use the Flyte Download Manager which can download multiple tracks simultaneously. There’s also a counter that shows you the number of times a track has been downloaded – overall limit is 4. The download manager is not fool proof though, as you can see below. I was able to fix this issue by letting the successfully added files finish downloading and then grabbing the Not Downloaded files once again from the site. It also seems that the download manager is getting updated frequently and notifies you if there’s an update available. One limitation is that you can’t select the download location till the files start downloading. So, only files added after this setting change are downloaded to the new location. 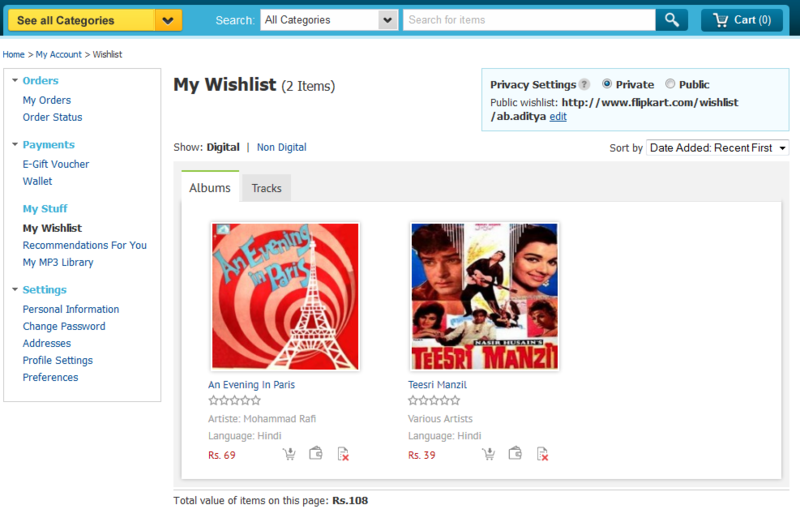 Price: The prices start at Rs 6 per track, which is for mostly oldies (there are some costing Rs 9 too). Most of the new Indian tracks and the International ones cost Rs 15. The highest I’ve seen so far is Rs 45 for some of the longer International tracks (Star Wars tracks for ex.). Entire albums, as expected, turn out to be cheaper than purchasing every track separately. Most tracks are also available in 3 different bitrates – 320, 128 & 64 kbps (not all oldies have 320 kbps versions though) which gives you flexibility in the bandwidth, storage and quality department. What’s missing: The catalogue is pretty comprehensive, especially from the Indian music standpoint considering that even small labels are available. The International scene also seems pretty good, but there are some notable omissions for the time being – Disney and The Beatles. Then again, even Apple took time to get The Beatles onto iTunes.